While the Phi Phi Islands are a chain of six islands, they are commonly referred to in the singular as Phi Phi Island. Maya Bay in the Phi Phi Islands was featured in the 2000 film The Beach, starring Leonardo DiCaprio. This helped inspire a subsequent increase in Phi Phi Islands tourism. In December of 2004, the Phi Phi Islands were devastated by the Indian Ocean Tsunami. It took years for the infrastructure to be restored. The Phi Phi Islands are is believed to be one of the oldest communities in Thailand, dating back to the prehistoric period. The best time to visit the Phi Phi Islands is from November to April, as this is when the area waters are at their calmest. Coincidentally, there are two main seasons in the Phi Phi Islands - Hot and Wet. The Hot season is November to April and the Wet season is May to October. Often referred to simply as Phi Phi Island, the Phi Phi Islands are comprised of two main islands that can be found off the coast of Thailand. Rising from the Andaman Sea, they entice travelers with their natural beauty and warm tropical weather. Take a virtual tour of Maya Beach, which is pictured above, and you will get an idea of just how beautiful the Phi Phi Islands are. The word "paradise" basically sums it up. As for getting to this tropical dream of a destination, there are three options. You can take a plane, hop on a ferry, or hire a speedboat. The planes, which are amphibious Cessnas, depart from Phuket and fly regularly in the high season. Trip time is only about 15 minutes. The ferries depart from Phuket, Krabi, and Koh Lanta. The ferry trips from Phuket take about two hours, while the ferries that depart from Krabi and Koh Lanta take approximately 90 minutes. As for the speedboats, they are operated by regional private charter companies, so the departure and drop-off points are flexible. Trip time is considerably less than going by way of ferry, so the cost is higher. Of the six different islands that make up the Phi Phi Islands archipelago, two get the most attention. These two islands are Ko Phi Phi Don and Ko Phi Phi Leh. The other islands are little more than rock formations that jut out from the sea. Ko Phi Phi Don is both the largest and most populated island in the chain. In fact, it is the only island with permanent inhabitants. It is interesting to note that Ko Phi Phi Don is almost separated into two different islands. A strand of flat land connects the larger landmasses, and it is on this strand that you will find the island's largest town, or village. As for Ko Phi Phi Leh, this second-largest island in the Phi Phi Islands archipelago consists of two shallow bays that are surrounded by steep limestone hills. The two bays are known as Maya Bay and Loh Samah. Maya Bay was featured in the 2000 movie The Beach and is largely responsible for the increase in Phi Phi Islands tourism in the last decade. 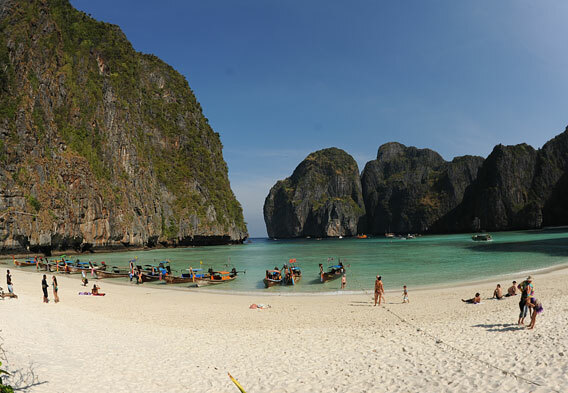 At Ko Phi Phi Leh's Maya Bay, you will find what is arguably one of the most spectacular tropical beaches on the planet. Commonly referred to as Maya Beach, it is an immaculate collection of soft white sand that is surrounded by rocky hills that are partly covered in green vegetation. Shallow turquoise waters meet the sand at Maya Bay, and the whole setting is almost too beautiful to believe. Other fantastic beaches in the Phi Phi Islands include Ton Sai Bay Beach, Loh Bagao Bay Beach, and Laem Tong Beach. These are all found on the larger island of Ko Phi Phi Don. It should be noted that all of the Phi Phi Islands beaches are spectacular, boasting soft sand, sparkling clear water, and plenty of scenic allure. In the end, it comes down to the kinds of activities that you want to enjoy and the amount of tourists that you want to share the sand with. Some Phi Phi Islands beaches offer more activities than others and attract larger tourist crowds. Both diving and snorkeling figure among the most popular activities among tourists in the Phi Phi Islands. This has everything to do with the clarity of the water and the area reefs. Full-service, professional operations offer both day trips and multi-day adventures for those who want to go scuba diving. They also offer PADI course instruction. Anyone who is interested in going scuba diving can consult the scuba diving map that appears on this page. 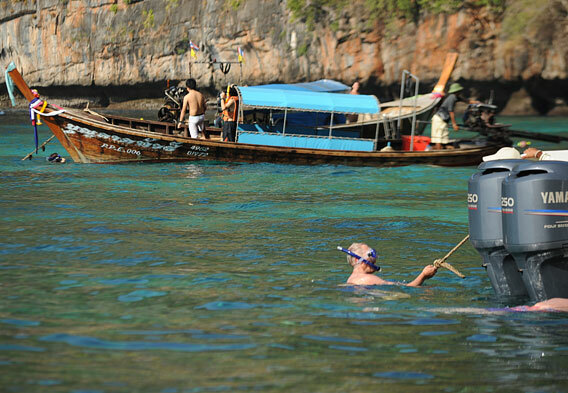 Should some snorkeling be the aim, it is possible to sign up for a group tour at any of the Phi Phi Islands hotels. There are also beachfront travel agencies that can help visitors arrange snorkeling excursions. These excursions are typically half-day private trips aboard longtail boats. 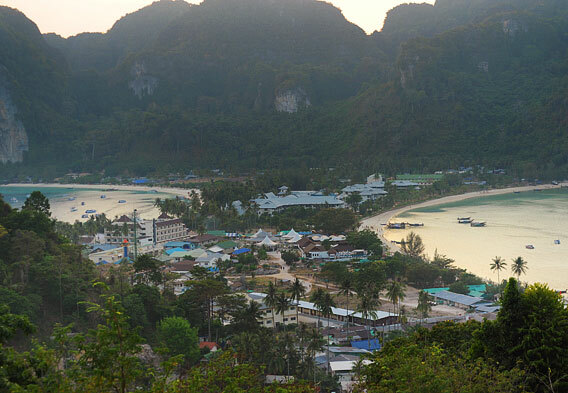 Other activity options that Phi Phi Islands visitors can enjoy include kayaking, fishing, and hiking. The accommodations in the Phi Phi Islands basically come in three forms. There are hotels, resorts, and bungalows. All can be found on the larger island of Ko Phi Phi Don. In relation to quality, most of the Phi Phi Islands accommodations fall somewhere between the two-star and four-star range. There is one five-star resort for those who demand the very best. The cheaper bungalows are among the most affordable lodging choices, and most can be found along the beach and hills to the right of Ko Phi Phi Don's ferry dock. The bulk of the hotels and resorts are found in and around the main village, though there are some that are located in more isolated areas. It should be noted that since the Phi Phi Islands tend to be pretty crowded, it can be difficult to find budget accommodations that are reasonably priced. In general, it is best to book any and all Phi Phi Islands accommodations in advance.